But letting yourself react to that frustration without truly understanding the nature of the problem will only temporarily bandage the issue, and it will continue to crop up each season and baffle you all over again! I was a Psych major in college. Understanding human thought and behavior has always fascinated me. Whenever I'm facing a frustrating problem in life, I look inward and use God's Word to shed light on what's going on. It leads to a sense of calm when I have a handle on my thoughts and emotions because I know how to control them instead of letting them continue to control my actions. So naturally, when faced with the problem of boredom over a closet full of clothes, I recommend starting with an understanding of your unique self. It will empower you to respond instead of react. And the problem may vaporize before your very eyes! Every person and their wardrobe is slightly different. Your reasons for being bored may be different from mine and the solution will differ too. So let's dig into some self-analysis to help you decide what to do with your boredom! Don't worry, after this quick self-check, we'll move into some practical steps to deal with (and prevent) boredom over clothes. Take a moment to diagnose your boredom using these probes. How these probes work: If you answer yes to one of these questions, the problem may not be in your closet at all! If you answer no to a question, the boredom issue may be caused by a closet that is lacking. #1 Personality check: Are you the type of person that gets bored of things quickly? Do you need lots of change and variety in your life? If you answered "yes," be aware that boredom over your clothes may be a normal, recurring feeling. Just because you feel bored by your clothes doesn't mean others perceive your clothes the same way. While you're thinking about all the new clothes you need to buy, others may be admiring all the varied outfits you wear. You could be #crushingit in the style department and not even realize it. Be aware of your personality and take an objective look at your wardrobe. If you answered "no" this prompt (you aren't someone that constantly needs change), it is possible that you are in genuine need of wardrobe refreshment. Option #1 (Basic Route): Go here to follow a pre-made wardrobe plan and shopping list. Option #2 (Custom Route): Take the 30-day Frumpy to Fabulous video course to learn A-Z about your style and how to rehaul your wardrobe on a budget. #2 Perception check: Have you recently developed an interest in fashion that you didn't have before? Have you been immersed in renovating your closet in the last 6 months? If you answered "yes," you might be experiencing decompression. The process of cleaning up and updating your wardrobe is exciting and inspiring. It's normal to feel like your closet is "boring" 3-6 months later when in reality it's simply the difference you are experiencing from a new wardrobe to a familiar wardrobe. Take this to heart: your wardrobe is amazing. You've worked hard to get it to where it is. You no longer have a frumpy mom closet, and THAT IS A REASON TO CELEBRATE--not to feel disappointed. Embrace the normalcy of "boredom" and get past it by enjoying the fruits of your work every morning when you get dressed in a chic mom outfit. If you answered "no" to this question, perhaps your closet truly is in need of some renovating. Use a wardrobe plan (one-size-fits-all solution) or my Frumpy to Fabulous course (custom solution) to create a plan to revamp your wardrobe. #3 Time-of-year/Season check: Is it near the middle or end of a season? If yes, you are probably getting the normal itch to break out the next season's clothes. This is normal and happens to everyone! If you are actually at the beginning of the season, it may be you are lacking the remixability of clothes you need to have variation in your looks. Use a wardrobe plan (one-size-fits-all solution) or my Frumpy to Fabulous course (custom solution) to create a plan to revamp your wardrobe. #4 Reality check: Do all the clothes in your wardrobe easily mix and match? Do you have good variety within each of the clothing categories? If yes, this is another sign that your wardrobe isn't necessarily the problem and shopping may not be the answer to your boredom. We'll talk about other solutions for you in the next section! If no, your wardrobe might need a makeover. Don't worry, this doesn't have to be hugely expensive... it actually always starts by paring down what you own even further (a free exercise)! Again, you can either use my wardrobe plans to evaluate your wardrobe or take the plunge deep into learning about your style and creating a lasting, ongoing solution for a better wardrobe with the video course Frumpy to Fabulous. How do you know whether your boredom with your clothes indicates a problem in your wardrobe? You need to determine whether or not your closet is well-rounded and remixable. In other words, do you have the right clothes in all the clothing categories? For a checklist, check out one of my wardrobe plans for moms. In other words, do the clothes mix and match easily? The core of a remixable wardrobe is sticking with a color scheme. For a basic overview of how to do this, check out this blog post. My course Frumpy to Fabulous offers a more thorough walk through understanding your style, body shape, and colors and how to shape a remixable wardrobe that reflects all of that. If you answered "no" to these questions, there's no wonder you are bored with your outfit options. They are probably extremely limited and you wear things on repeat. Use one of the solutions I linked below the questions to get started fixing the problem. 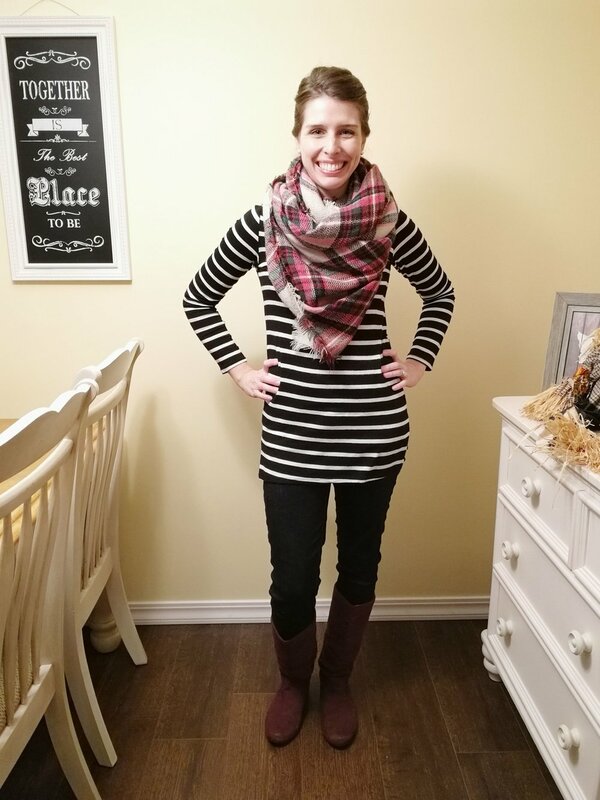 Thousands of moms have used my process to update their wardrobe and are loving the results! Here is an easy summary of my tips above as well as guidelines for helping prevent closet boredom. Even fashionistas with unlimited budgets get bored of their clothes. It's a human thing to want newness. I'm decompressing from the big closet renovation I just accomplished. It's normal to feel bored. Instead I should feel grateful and enjoy the wonderful wardrobe I've worked hard to shape! I'm itching for a change of seasons. I want to trade my boots in for cute sandals. That doesn't mean I need to shop for new boots. Enjoy boot season, it'll be over before I know it. I can practice contentment instead of letting my boredom spoil all the great clothes I do have in my wardrobe. Isn't it empowering to take control of your thoughts instead of letting them control you? I love it! Let's say you really do need to rework your wardrobe. When you go shopping, you want to avoid the pitfall of just heading to the store (or hopping online) without a plan. Anything new that you bring home will temporarily feel like you're solving the problem, but buying the wrong clothes will only get you into a vicious cycle of boredom and shopping sprees. Focus on basics. Always start by building up the core of basics in your wardrobe. These are covered in my wardrobe plans and more in depth in my video course. Basics are crucial because they are the building blocks to many outfits. Avoid the pitfall of just adding more unique tops or trendy shoes before you have all your basics covered... you'll never feel like you have what you need to mix and remix your clothes. So if you have the itch to shop, add to your basics--you can't go wrong there! Case in point: the top below was not a great fit, and yet I made the mistake of taking it home because I was tired of looking for a mint top. I've worn it only once... I shouldn't have brought it home. Need to change things up often? Know when to skimp on quality. If you're someone who likes to change up the look of their wardrobe often and to bring in new pieces, consider skimping on quality for non-basics like print tops and scarves and some shoes. It's not worth paying premium price if you'll want to change it next year anyway. On a budget? Add accessories and completer pieces. If you're on a budget but really need to add some variety to your wardrobe you can also simply add some accessories and completer pieces. Scarves and jewelry, as well as cardigans or vests will pair with many of your outfits, creating a much more widespread effect that you would achieve with just one or two new shirts of the same price. You know I usually warn against too much color craziness in your wardrobe. But while it's crucial to stick with a color scheme (it allows remixability), it's also important to actually apply that color scheme! When your outfits constantly have the same two or three colors (especially neutrals), you might simply be visually bored. Having the ability to create outfits with distinct colors can help keep things varied and interesting. If you are someone who errs on the side of neutrals but who actually loves COLOR, look back at your color scheme and see if you can bring some more in with accessories, tops, or cardigans. Here's an example of how I'm using my entire color palette to create that sense of variation among my outfits. Did you know your hairstyle is like an accessory? If you try a new hair cut or color, you will probably find that everything in your wardrobe feels fresh again. It's because your hairstyle is like those statement earrings or trendy scarf that is making everything look different. If you're not wanting a drastic hair change, try out some new hairdos. You can also focus on trying new things with your make up. Look up makeup tutorials on Youtube! Honestly, this solves so many problems! It's too easy to default to wearing our clothes the same 2 or 3 ways over and over again. Most likely you're bored of your outfits, not necessarily of your options. To explode the options for combining your clothes, grab one of my outfit guides. They will show you hundreds of new ways to combine basic pieces that most moms already have in their wardrobes. 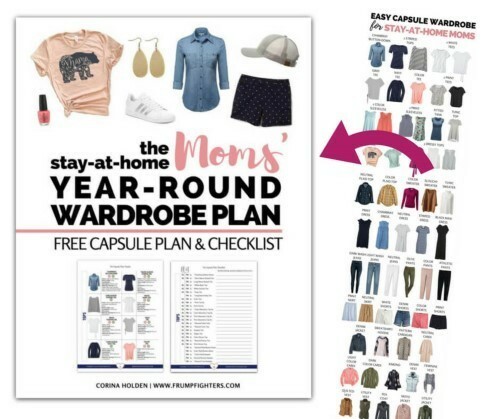 Here are what some moms in the Frumpy Fighters group had to say about how the Full Year Wardrobe Outfit Guide has helped them. This might seem like a drag, but actually it's super easy with one of my outfit guides. Just scroll through the ideas (or flip through if you have the print!). Think about what you have going on each day and then pick a look. Scribble down the numbers you want to try on a sticky note and keep it by your bed! Somehow, having your outfit assigned ahead of time avoids the bored feeling that hits when you're staring at your closet with no new ideas on what to wear. Is your wardrobe in great shape already? Perhaps just a psych adjustment is in order to help you ENJOY the fruit of your labor. Because remember: fighting the frump is not about looking different every day, it's about simply looking put together. Celebrate the fact that your mom wardrobe makes this possible! Are you simply in need of new outfit inspiration? Check out one of the outfit guides to have your outfit ideas laid out for you every day. Is your wardrobe in need of a help? Announcement: Doors to my course open January 24! Was this post helpful? Please let me know in the comments below so that I can write more posts like this!